Home » » Interview - TANKARD - We are not as wild as in the beginning, but sometimes we still gonna have some great parties. 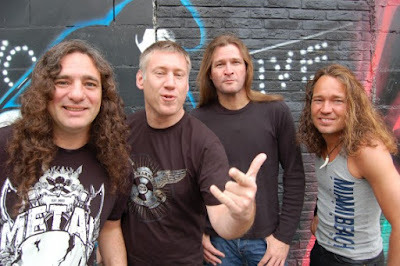 Interview - TANKARD - We are not as wild as in the beginning, but sometimes we still gonna have some great parties. 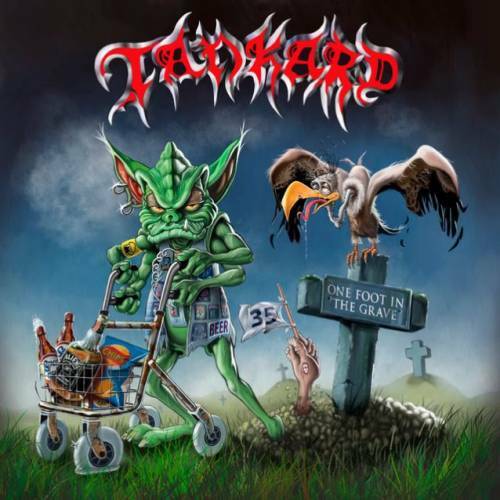 Interview with legendary German thrash metal band TANKARD. Ave TANKARD! 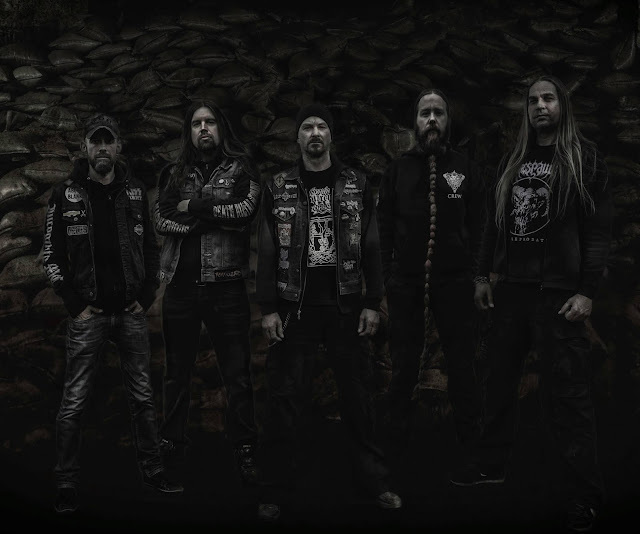 In June you released your new album “One Foot in the Grave”. I am just listening to it and I have to say that you are maturing like good wine. The album feels very fresh. Where some of your colleagues are confused, you totally smash everything with your thrash metal. How do you feel now about your album? Why did you choose this title? Do you feel that old? - Thanks a lot for your kind words, we are still really satisfied with the result and hope that the fans gonna like that album too. The album title is not really seriously, a typical Tankard joke although we are very old guys hahahaha……..after 35 years we had to do a break, so we are really looking forward for the next 35 years! The first thing which everyone thinks about when they hear TANKARD is the connection between thrash metal and beer. But in your lyrics you criticize many of today´s problems. You sing about politics, social topics and I have to say that your lyrics make sense. How did you write the lyrics on the new album? For example “Syrian Nightmare” is about very current issues now. - We always try to do a good mixture of serious and funny stuff. Nowadays we live in very strange times, so the focus is more ion the serious topics. When we started with Tankad we did a lot for that kind of image, later we wanted to get rid of it, we really failed. Today we gonna make a lot of jokes about our own image, we don`t take ourselves too seriously, we don`t go blind through life, that´s the reason for a song like “Syrian Nightmare”! On the one hand it makes us very sad what happened over there, on the other hand it makes us really angry, because so many countries are involved of that conflict, but nobody really takes care about the normal people, they have to suffer and die! The long-standing iconic thing for you band are the covers by Patrick Strogulski. This year´s album is especially great. This is how I feel when I get up in the morning. How did you started to work with Patrick? - He was a student of mighty Sebastian Krüger did a lot of old legendary Tankard Covers. Mr. Strogulski worked the first time for us in 2012, creating the “A girl called cerveza” Cover. I really love the new cover, one of my Tankard top Five! “One Foot in the Grave” has a really good sound. It is sharp, it cuts and at the same time it is very readable. 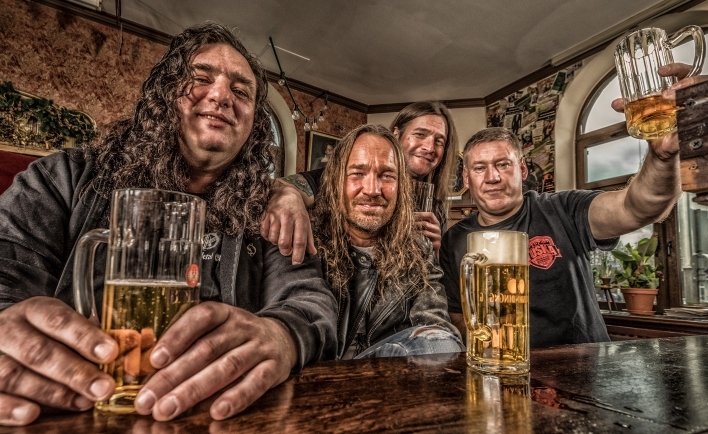 How does TANKARD compose new songs? Do you have your own routine while recording? Or is it different every time? How would you compare composing at the beginning of your band and now? The technology is completely different now. - Our guitar player Andi wrote 7 seven songs and Frank three songs. I get some guitar parts and try to find vocals for that, then we gonna meet at Andis place because he has a little studio and record. We discuss which vocal parts we can use for the chorus and which for other parts. Of course that is all much easier than 30 years ago, you had to work out everything in the practice room and it took much longer time! This year you are celebrating 35th anniversary. How did you manage to keep the band together for so long? Now even families last that long. Have you ever had a submarine disease when you wanted to kill each other? - It really feels like an old family when we go on tour, of course sometimes we have a little bit trouble, but that is normal when you hang around for such a long time. But we never wanted to kill each other hahahaha……..after a couple of beers we are the biggest friends again! I will definitely celebrate the anniversary and I can even imagine how. But how about your fans? Do you have any gifts for them prepared? I would say something like T-Shirts, compilation or vinyl limited editions or something? - There is a special box of the new album, a pic disc and a limited blue vinyl. But the most important thing is to celebrate together with the fans at our shows. We really love them, without them there would be no Tankard, so we are really thankful still to be a part of the metal scene after 35 years! Gerre, when you look back, what period of time was the best for TANKARD? You have experienced a lot so far and you are a thrash metal icon. How do you see thrash metal over years? You played even when thrash metal started and you become an inspiration for many other bands. Do you think that this music style has changed? - Thrash was very successful when it started in the eighties, in de middle until the end of the nineties nobody was really interested anymore, from the 2000 years there was a revival of and Thrash is still here! We are really glad never to give up in that hard times and I think Thrash will really survive. There will be always different waves of Metal, and thrash will be sometimes more or less popular but it will survive, we hope to join that as long as possible. You play on concerts a lot. But let´s be honest, you are not “youngsters”. I assume that those times when you drank all night and played concerts are gone now. Or are they? Am I wrong? How do your tours go? How is TANKARD during tours? Bunch of guys, together all the time. Again, do you want to kill each other sometimes? - Of course we are not as wild as in the beginning, but sometimes we still gonna have some great parties. We don`t wanna kill each other, that is for sure, but we make a lot of jokes about each other, it is still very funny! You are a veteran now who experienced a lot (musically). The world and music industry has changed. There is the internet, downloading music, CDs are sold out less and less, the generation of fans has matured and grown old and they maybe do not care about music anymore. Thrash metal is not “in” now. How all those changes did influence TANKARD? How did it affect you? For example, do you have to do more concerts to earn money? - As we all have regular jobs we don`t have to live from the music, so it doesn’t matter if we gonna sell a lot of records. Everything changed that’s right, but we are fossils and keep on going until the very end! I searched some old interview and I even found some of my printed magazines but I did not find any information about the author of your logo. So who is the author of TANKARD´s logo? Do you even have time to listen to your favorite music? I know you have a lot to do like playing on concerts and recording new songs. Are you familiar with new bands? Do you like to discover some new albums and bands? If so, what are the best albums you have discovered recently? Thank you so much for your answers. You are one of my favorite bands since your beginnings and I am honored to do this interview with you! Congrats on your 35th anniversary and I wish you luck in personal and music life, a lot of success and hundreds of true fans and sold music. - Thank you for your support hope to meet you on tour to have an orange juice together!